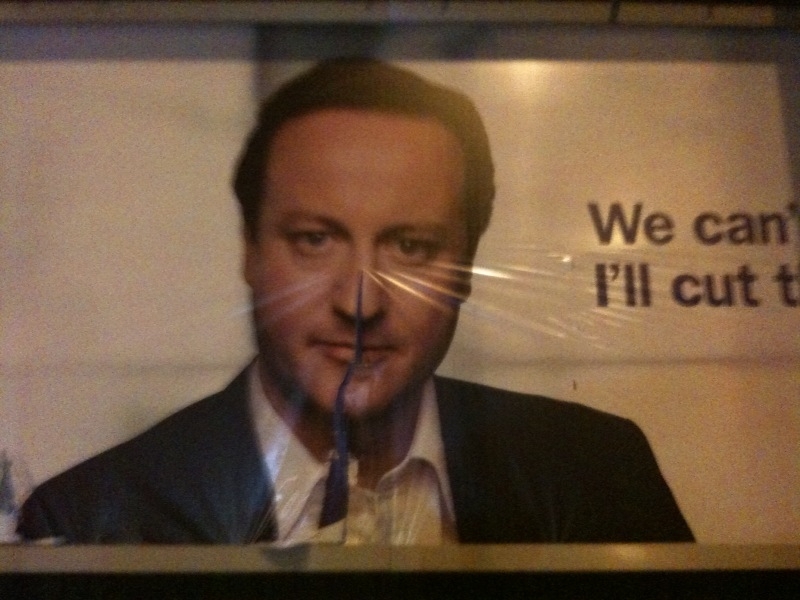 I’ve now been sent 3 photos of the Conservative’s new poster, featuring David Cameron, that have been deliberately disfigured. Given I’m aware of 3, there must be a great number more. 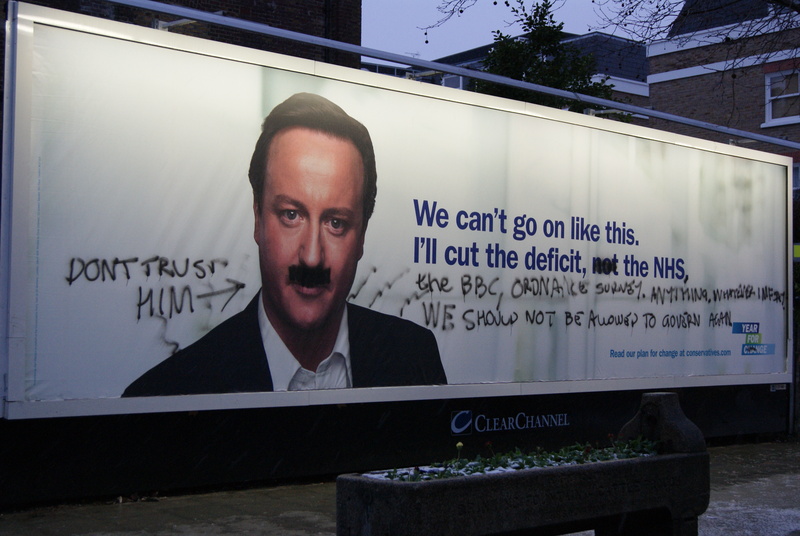 This level of vandalism doesn’t really occur on non-political advertising. This could easily be anti-political / anti-establishment sentiment that has always occured at every election that the internet has made easier to document and share. Or is it hostility aimed directly at the Tories and evidence that Dave hasn’t quite managed to shake off the ‘nasty party’ label? 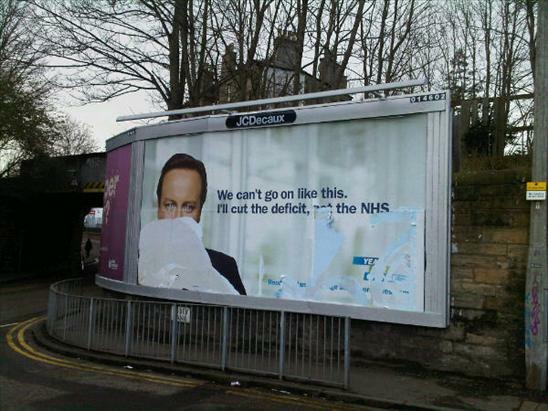 It will be interesting to see whether Labour’s posters (if they ever manage to afford to put any up) recieve the same treatment. the sheer quantity of Conservative posters that have been’changed’ to reflect a general ‘distrust’ of all political parties is not to be unexpected by anyone…Politicians have become the ‘bad-smell’ of UK society and all of them need a kick up the arse. I just hope this election gives them a hard one and most of them loose their Seats. They are the bad smell of the country, David Cameron was right, “We need a revolution”, except we don’t mean by polical voting for one or two parties of the same bullsh*t government, we need to line the fking lot up against the wall, and just start shooting, members of Lords, Parliment, stock-brokers, financial-advisers, money lenders, mortgage companies, insurance salesmane and companies… all the fking scam artists, wiped clean in one fking swoop. The one problem will probably be lack of bullets, as for work-creation, instead we get enforced slavery… maybe a mushroom cloud over the city of London will create some damn jobs… for that matter the affluent areas of most of the major cities.